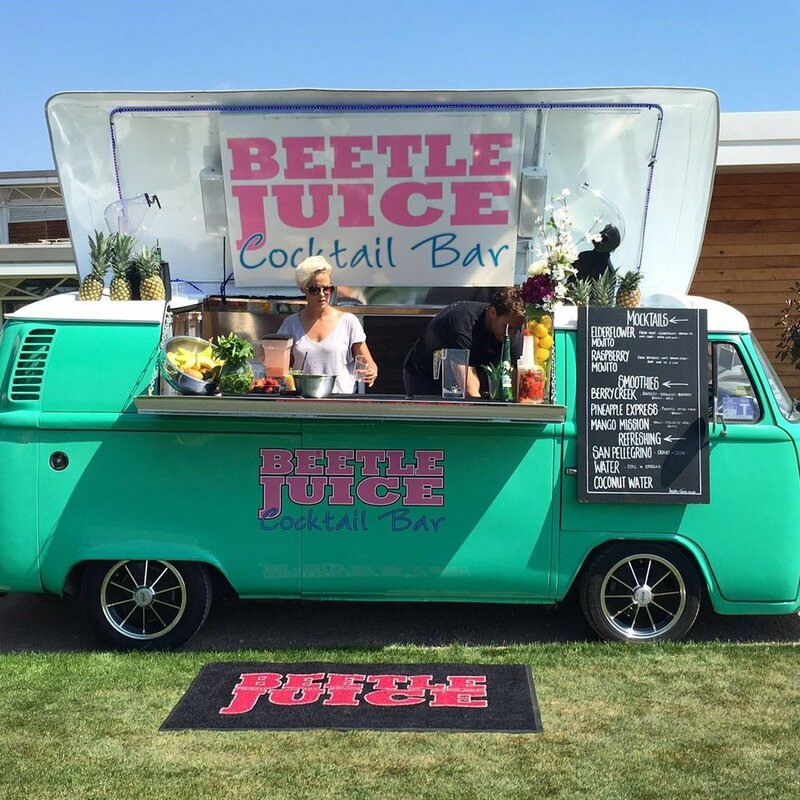 MEET THE BARS — Beetle Juice | The original VW cocktail bar - we bring the party to you! Most of our bars started life as original 1970’s VW bay window van. We have restored them and converted them to our unique design into self-contained cocktail bars. Each bar is unique in its colour scheme and personality, but they all conform to a minimum Beetle Juice standard. They come with a powerful built in sound system, lighting and all the equipment to deliver a mobile bar experience. We sometimes get accused of vandalising these iconic vehicles, however we believe that they were designed as commercial vehicles and we are just giving them a new lease of commercial life and getting them out working in the community. In some cases our sympathetic restorations have kept them from the breakers yard. Our conversions are no more drastic than many of these vehicles experienced being converted into camper vans. 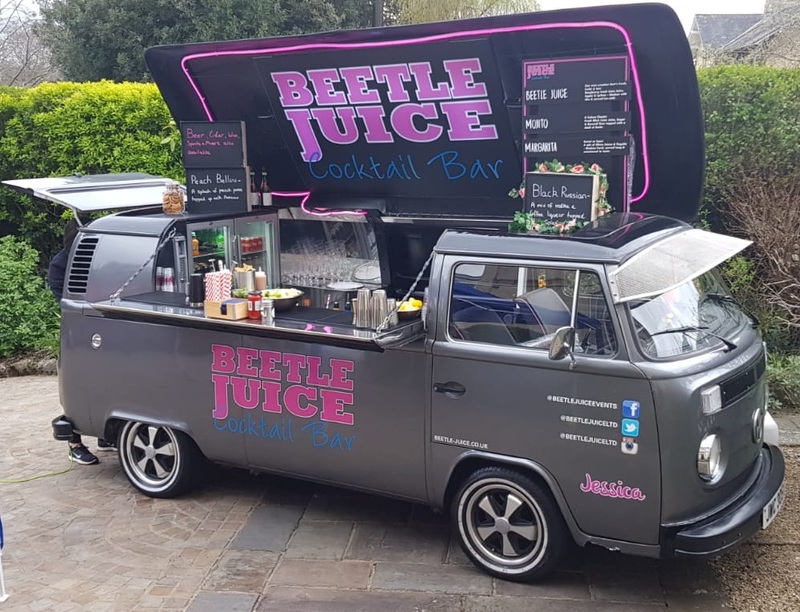 So please meet the ladies, they just love to party……..
Gracie has a special place in the Beetle Juice story as she is our original bar that we built during 2012 and she has been earning her keep ever since. She has been our most popular bar at private parties and weddings and is often seen gracing a marquee, barn or a country garden. She is a 1979 vintage and started her life in Australia so is a right hand drive model. Gracie has been through a number of incarnations of lighting and logos as the Beetle Juice style has evolved. She had a major restoration and upgrade to the latest Beetle Juice specification in 2015. In 2017, Gracie had a major structural restoration with many new panels, some lovely new seats, another upgrade of her interior to the very latest spec and she went from Silver to a deep rich Red. For 2019, she will be out and about to many events based from our head office in Farnham Surrey. Gina became our second bar. She is the festival queen having attended events the length and breadth of the country. She started her life as a bread van in Greece in 1978, but having made it over to the UK has found her real raison d’etre. She has had an eventful life with us and has been in and out of camper van hospital, but nothing can stop Gina who is many peoples favourite with her bright and bold colour scheme. Her favourite event has been serving healthy fruit juices to the Arsenal First team squad at their summer BBQ. Alice was originally registered in 1979 and she started her new life working for us during the 2014 season. She spent most of her first few years with us in Wales based near Cardiff. She is lovely to drive with perfect road manners and has proven very popular at a wide variety of events. She wowed many prospective brides at the National Wedding Show at the NEC where she was one of the stars of the show. Alice had a bit of a bump in early 2017 when someone following her used her as their brake at a zebra crossing causing damage to the rear and a seized engine, but she has now had a lot of TLC, a rebuild, new engine and she has also now been upgraded with our latest roof design and interior specification. For 2019 Alice will be based with Lewis in the Midlands. Ellie started out as our little Green leftie and was going to be named Carrie in honour of Caroline Lucas (left leaning leader of the Green party). But as Ellie is now resplendent in turquoise after a full Beetle Juice makeover, we decided to instead name her after ‘Ellie’, our bar manager that she worked with during most of the last two years. Ellie has attended many a wedding celebration. She does have a wilder side though and attended Download, the rock/metal/punk festival held at Donington Park where she was a very popular attraction indeed. For 2017, Ellie went off to San Diego for a year, only to return to the south west coast of England where she resides in the quaint town of Looe, in Cornwall. Mark (large rum and coke) and his wife Allison (Sauvignon Sas) now run the party bus in the South West after getting out of the pub game. Olivia is a 1979 registered van and came originally from the West Country. Olivia spent a few years down in Cornwall where there is a huge following for VW vans particularly around the north coast surf beaches. In 2016 she moved to Hythe, Kent where we trusted her to the care of our Franchisee, Toby. For 2019 she has had even more upgrades and will again be seen at many events in Kent and the South East. Toby is getting booked up fast so if you are thinking of hosting an event in Kent get in touch as soon as possible! Erica is our Cream bar. She is currently our oldest bay window van and is an early cross over bay model from 1972 (you can easily tell by the position of the front indicators). We originally tried unsuccessfully to buy her in 2013, but we finally succeeded in acquiring her in 2014. She is elegantly finished in a pearlescent cream finish and she is a very popular bar for weddings and private parties. Skyla is the first bar that was run by April, our original Franchisee in Cheshire. Skyla has also had an interesting past. At one stage she was almost consigned to the scrap heap as she was in a really poor condition. She was given to the previous owner in Northern Ireland who then stored her in a friends garden whilst he thought about the task of restoring her. This of course never happened so she rotted a bit further until the owner’s wife and some of his friends got together and decided to fully restore her as a surprise birthday present and what a surprise that was. He enjoyed his restored van for a few years and with kids growing up, he decided to sell her and we purchased her in the summer of 2015 driving her back from Belfast via the Liverpool ferry. Since then Skyla has gone through another major mechanical and total bodywork restoration. She has been upgraded to the very latest Beetle Juice specification and April has added her own personalised interior. She can now truly be described as in concourse condition – and there is no doubt that she really does have the ‘wow factor’. Jessica is one of our most popular bars. She came to us in late 2015 from the Cardiff area and joined the fleet for the 2016 season. She had her first event at the Surrey Country Show in May 2016 and has graced many events since then. Jessica is a 1979 vintage van that has been upgraded mechanically with twin carbs and is certainly one of the nicest vans to drive. She is in exceptionally good all round condition for her years. For 2017, Jessica had a change of colour from her original light blue to a silver/grey wrap and she has spent the last year in Devon., our Franchisee in Devon - catch her at various events across Devon. Watch this space to see where to spot Jessica in 2019. Lola was another addition to our fleet in 2016 and made her debut in the first weekend of June that year. She was already in great condition when we purchased her with much of the mechanical work that we typically undertake prior to the conversion already completed, and we love the colour. We purchased Lola from a guy that saw us at the Isle of Wight festival and then contacted us last summer, we are really glad he did. 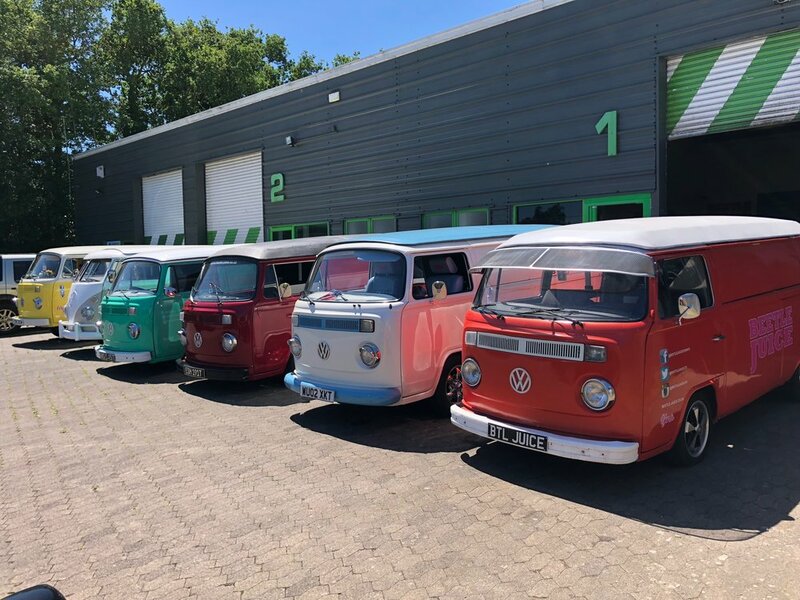 Lola had a very busy summer and for 2019 she is working from our head office in Surrey. Dixie, was our 10th bar. 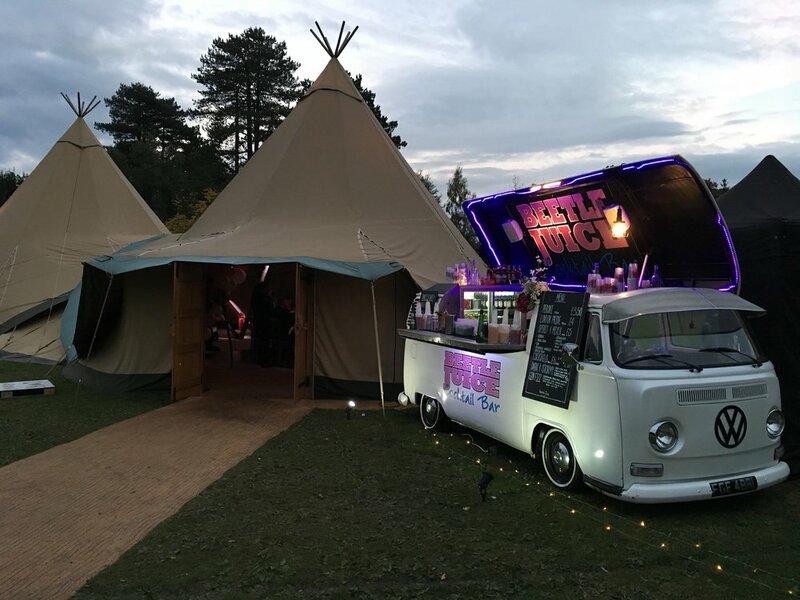 Initially we rebuilt her as a stunning promotional marketing bar for drinks company Lanique who commissioned us to tour the country with her throughout 2016 and 2017 attending a number of shows, festivals and events, including strutting her stuff at the Edinburgh Fringe, the Imbibe drinks exhibition at Olympia, Hampton Court craft fayre and Jersey Fest to name a few..
She is in high demand and has been dressed up for lots of other brands including Carnaby Street, Aussie Hair care, Bulleit Bourbon and most recently Taylor Morris eye wear for whom she has operated as a mobile shop and demonstration unit. She still returns to Beetle Juice branding every now and again to keep her hand in at dispensing delicious cocktails..
Dixie is a an early split screen (Splitty) van that has come from South Africa. We have finished her in a rather lovely dusky pink grey and white duo tone paintwork..
We are proud to announce we have finally crossed the Scottish border! 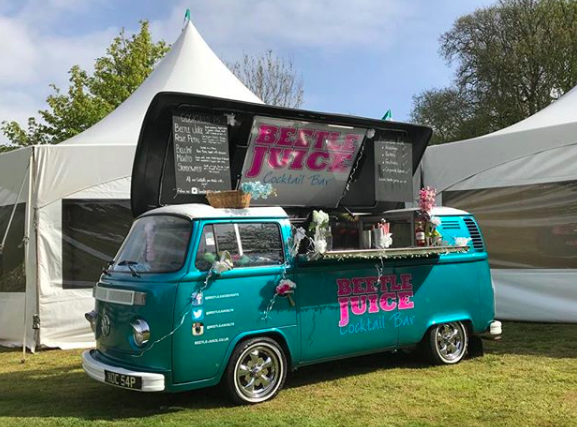 Our franchisee Sameer had spent 4 years studying at Edinburgh University and in 2018 started taking Bonnie, our beautifully converted VW T2 into all the hottest events in Scotland. Bonnie was found and imported from Hungary in late 2017 and we spent that winter turning her into a stylish cocktail making machine. Originally painted in green from the factory but we gave her a fitting wrap in stunning turquoise and cream and she is now wowing the highlands. The previous owner of Vera approached us and asked us if we would convert her into a Beetle Juice bar. She was in pretty good shape and had a rather strange window installed in her side door (now long gone thank goodness). She has undergone a major mechanical overhaul and been converted into the latest Beetle Juice specification and joined our fleet in 2017. We really liked her bold blue colour scheme and smart wheels so we kept these. Team Vera has now been operating since 2017 out and about in Yorkshire and the North East piloted by Dan and Claire, our very popular North East franchisees. .
Lilly is another interesting van. She is our first 'South American' van having been built in Mexico rather than Germany. The main visible difference to the German vans is the roof line, which has disappeared now the conversion is completed. Lilly was imported new to the UK and is a very low mileage and well kept vehicle. She even has a decent heater and modern mechanics although still running an air cooled engine. She was originally white when built but had been repainted in an army green colour when brought over to the UK. Lilly had her Beetle Juice conversion in early 2017 and has been repainted back to a creamy white colour and now with some smart blue trim and a fantastic new interior. She has previously been spotted working in the North West but has more recently been one of the most popular bars to re-brand and has been decked out in many companies corporate branding including Black Tower, Aussie Hair care and Tiger Trailers. Isla is another lovely van that we acquired in 2017. She was converted to the Beetle Juice specification during the spring of 2017 and is now in a fabulous two tone colour scheme, white up top and a rather splendid mint green wrap on the bottom half. She undertook her first event down in Kent at the start of May and has subsequently spent her time working mainly in Surrey (often seen at the University campus) and the periodic trip down to several beach festivals down in Cornwall. Maggie is one of our latest builds. She is a left hand drive model that previously resided in the warm climate of southern Europe which is partly responsible for her current good condition. Maggie was completed in March 2018 and had a fantastic first year.. If you catch her Sunfire yellow paint on the roads you will most likely see Max driving her to his next event. usually somewhere in the South of England. Well now for something just a little bit different ! Sophia is our latest acquisition and is in all probabilities a totally unique vehicle. Based on a 1970's bay window van she has been beautifully sculptured into a quirky seating unit. So if you are looking for some seating for your VIP area or marquee or maybe a mobile meeting room or an interesting addition to an exhibition stand, a viewing platform for a sporting event or a multitude of other uses then get in touch and book Sophia. We can wrap her in any colour and change the seating colour if desired or just use her in her stunning Orange livery. Rosie is our red lady and she was probably in the nicest condition and best cared for van that we have bought. She did have a recent nasty gash on a door when we acquired her but we soon had that repaired. She is of 1978 vintage and was owned by two lovely ladies who live in the North West who, we are pleased to say, are enthusiastic Beetle Juice cocktail customers when we meet them at VW shows. Rosie is a joy to drive and a very popular member of our line up that we use mainly for marketing and promotional events. Ivy is another 1979 vintage van. Poor Ivy came to us in quite a state with a big hole in her engine leaking all her oil away and in serious need of some new doors and a body make over. She is in the process of being restored to her former glory with a new heart, an interesting new colour scheme, lights, music, fridge and all the other Beetle Juice goodies but each time we make a bit of progress with her then someone comes along and pinches a part for one of our other bars ! We are hoping though that this year will be the year that we will finally get her finished and out operating as a fully fledged member of our fleet.